We’d love your help. 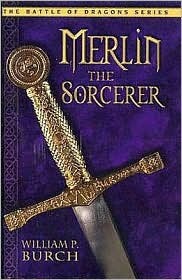 Let us know what’s wrong with this preview of Merlin the Sorcerer by William P. Burch. Archeologist Merlin Lakin is asked to find out why the ancient Mayan kings disappeared. Merlin locates an ancient research center where Mayan scientist discovered the secret of time travel. King Arthur II of Great Britain commissions Merlin to find the truth about the King Arthur of legend. Merlin finds romance, mystery, adventure, and friendship as he continues his quest. To ask other readers questions about Merlin the Sorcerer, please sign up. I really wanted to like this book more. The concept is *very* cool, and for the most part the story moved along nicely. Unfortunately the story is hampered a bit by a few issues. For one the story included a rather clumsy attempt at a romantic subplot which ended up reading like the naïve fantasy of a 15yr old geek. (I should know, I was one once). It was painful to read, never actually went anywhere and in the end contributed nothing to the story. Hopefully without giving to much away, my othe I really wanted to like this book more. The concept is *very* cool, and for the most part the story moved along nicely. Unfortunately the story is hampered a bit by a few issues. For one the story included a rather clumsy attempt at a romantic subplot which ended up reading like the naïve fantasy of a 15yr old geek. (I should know, I was one once). It was painful to read, never actually went anywhere and in the end contributed nothing to the story. Hopefully without giving to much away, my other main issue has to do with a plot point of why the main character is actually doing what he's doing. He goes through all this trouble to find out a specific piece of information for someone, yet in the end it's never even discussed whether he even gets that information or not.